M.S. 750 yılında Halifelik döneminde Pers topraklarında Horasan (sarı). Büyük Horasan veya Antik Horasan (Farsça: خراسان بزرگ veya خراسان کهن) Antik İran'ın tarihsel bir bölgesidir. İran'dan sonra sırasıyla Afganistan, Türkmenistan, Pakistan ve Tacikistan sınırları içinde de alanı vardı. ^ "Khurasan", The Encyclopaedia of Islam, page 55. Brill. Erişim tarihi: 2010-10-22. 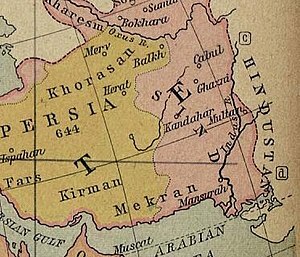 In pre-Islamic and early Islamic times, the term “Khurassan” frequently had a much wider denotation, covering also parts of what are now Soviet Central Asia and Afghanistan; early Islamic usage often regarded everywhere east of western Persia, sc. Djibal or what was subsequently termed 'Irak 'Adjami, as being included in a vast and ill-defined region of Khurasan, which might even extend to the Indus Valley and Sind. ^ "Khorasan". Encyclopædia Britannica Online. 3 Mayıs 2015 tarihinde kaynağından arşivlendi. Erişim tarihi: 2010-10-21. historical region and realm comprising a vast territory now lying in northeastern Iran, southern Turkmenistan, and northern Afghanistan. The historical region extended, along the north, from the Amu Darya (Oxus River) westward to the Caspian Sea and, along the south, from the fringes of the central Iranian deserts eastward to the mountains of central Afghanistan. Arab geographers even spoke of its extending to the boundaries of India. Bu sayfa son olarak 26 Mart 2019 tarihinde ve 20.27 saatinde düzenlenmiştir.